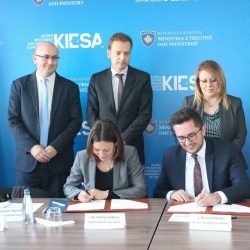 The Government of Kosovo signed an Agreement to join the Enterprise Innovation Fund (ENIF) as a Limited Partner. Kosovo Government joins ENIF in the subsequent closing, bringing the total fund size to more than EUR 40M available for investments in high growth potential tech companies in Western Balkans. Hekuran Neziri (EBRD), Libor Chlad (EU Representative in Kosovo), Tatjana Zabasu (SCV), Besian Mustafa (KIESA), Hykmete Bajrami (Minister of Trade and Industry) and Olivia Somers (EIF).